While the British soldier was known as ‘Tommy‘, the French soldier was called ‘Poilu‘ – literally translated the ‘hairy one’ as French servicemen were not required to regularly shave in the same way British ones were. This image was taken in front of the church in the village of Caix on the Somme in May 1915. It shows two men, the one on the right an officer, of the 414th Regiment d’Infanterie. This infantry regiment was formed in March 1915 and it’s original personnel was made up of 3/5 of men from the Class of 1915; those just conscripted at eighteen, so it was predominantly a very young regiment. It moved to the Somme front shortly afterwards and took over what the regiment’s history called a ‘quiet sector’ at Foucaucourt. It then moved to the Santerre plain area, where this photograph was taken. 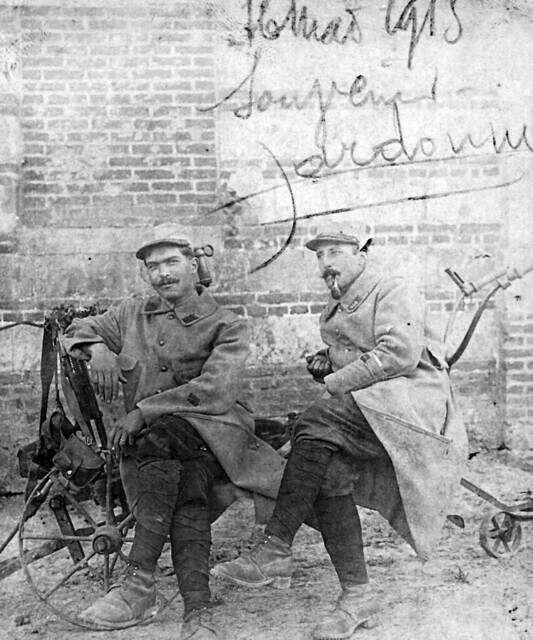 Four months later the regiment moved to Souchez to a landscape smashed flat by shell fire and in 1916 at Verdun, so one wonders what happened to these two Poilus in the months following the taking of this tranquil photo; resting in a quiet sector on an old plough, an echo of older times. This entry was posted on 12/01/2012 by sommecourt. It was filed under France, French Army, Somme, Western Front, WW1 .